If you accidentally blocked someone and you no longer receive emails from that person, you can unblock the person at anytime. Note: This keyword can be accessed only within the AOL software. 2. In the Block mail from addresses I specify text box, remove the email address that you wish to receive emails from. In the top row, labeled From Header, select contains from the pull down menu. Enter the address in the text box next to the pull down menu. 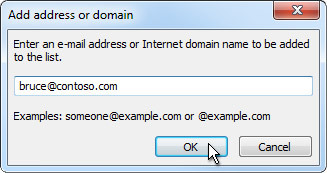 Example: You can either give a specific email address or use @xxxxx.com or *xxxxx.com to whitelist the domain (replace the xxxxx with the domain name). Look for the email address you want to unblock in a rule that has Delete it as the action under Do this:. Click delete for that rule. Click edit for that rule. Locate and delete the address you want to unblock in the From field. Make sure addresses to delete are still separated by '|' after you have deleted the address (if more than one address remains). If you want to remove someone from the blocked senders list, follow the instructions below. Select the address or domain you want to unblock and then select . There are times when you don't want messages from a specific person or domain to end up in your Junk Email folder. Messages from addresses or domains on the safe senders list won't get moved to your Junk Email folder. Enter the email address or domain you want to add, and select . To stop receiving email from someone, you can add his or her email address to your blocked senders list. Outlook automatically moves any new mail you receive from this person to the Junk email folder. When you want to receive mail from this person again, you can remove his or her email address or domain from your blocked senders list. On the Home tab, click Junk, and click Block Sender. Outlook adds the sender's email address to the blocked senders list. Note: You can restore any of the mail that is in the Junk email folder. Click the message that you want to move to the Inbox folder, and then on the Home tab, click Junk, and then click Not Junk. On the Home tab, click Junk, and then click Junk Email Preferences. On the Blocked Senders tab, select the email address or domain you want to unblock, and then press the Delete key. To add a person to the Safe Senders List, click a message from the sender. On the Home tab, in the Deletegroup, click Junk, and then click Never Block Sender. If you have existing lists of safe names and addresses, you can move that information into Outlook. Click Import from File and browse for the list file that you want. To create a file that uses your current list, click Export to Fileand then specify where you want the new file saved. There are times when you don't want emails coming from a specific person or website to end up in your Junk folder. Select Settings > Mail > Accounts > Block or allow. Under Block or allow, select Automatically filter junk email. Under Safe Senders and Recipients, type the email address or domain, so that emails from the sender or domain don't get moved to your Junk folder, and then select Add . Tip: To edit or remove emails or domains from the Safe senders list, select the item in the list and then select Edit or Remove .